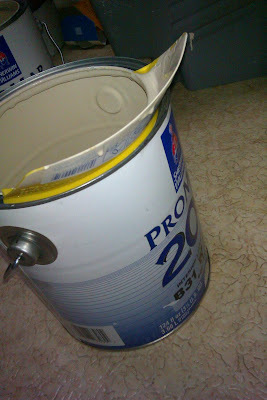 Fits-All Paint Can Spout or "Paint Can Visor"
I was asked to try out the Fits-All Paint Can Spout from Form Pro. I generally dont like these kinds of gimicks partly because its another thing to clean and to cary in the tool bucket. But after using this thing I feel that it would be worth it to leave it in the bottom of the tool bucket. This pour spout does an excellent job of keeping paint off the side of the can and also out of the rim. This makes it easier to read the label of the can for future reference and put the lid back on the can. Generally when I complete a job i prepare a touch up kit for the customer. But sometimes it makes more sence to leave the gallon container. 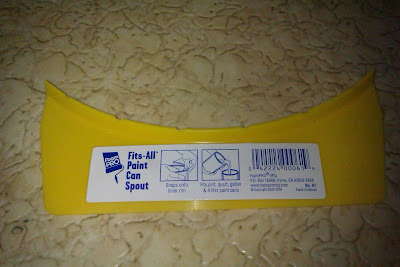 From this point forward i an going to make a more concious effort to use this pour spout. I am a clean freak and you can see that the can is very clean after pouring paint.